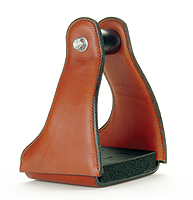 Attractive leather covered aluminum stirrups to compliment your saddle. These are excellent lightweight stirrups. They are designed to keep you comfortable and relieve stress on your muscles and joints during long distance riding. The wide, deep foot bed lined with closed cell foam provides comfort for knees and back and helps prevent rider fatigue. Foot bed: 4" x 5"